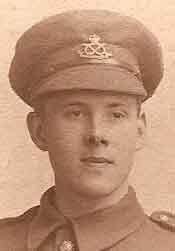 1ST MAY 1916: HOME LETTERS FIND ME IN BARNS, CAVES, HUTS, SCHOOLS & TUMBLE DOWN DUGOUTS WITH RATS SQEAKING! 29th April – 1st May 1916. BATTALION TRAINING. 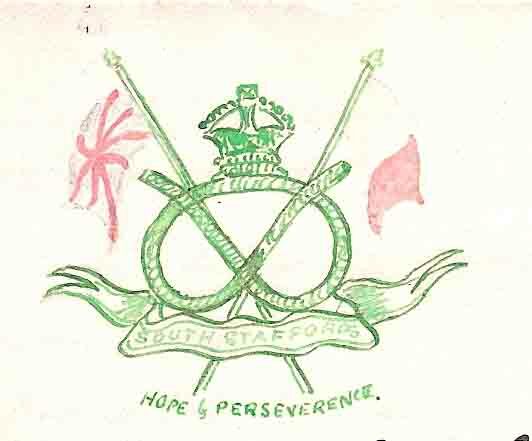 Pte BERTIE HIBBETT, No 3 FIELD AMBULANCE N. MIDLANDS DIVISION: THE PICKWICKIAN LEAFLET to IDA HIBBETT, 95 Foden Rd Walsall. 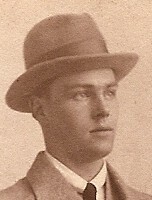 ‘Dodger’ Basil Hibbett Age 18. 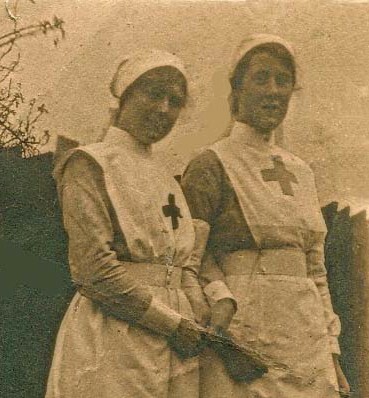 VAD Nurses Ida Hibbett & May Overend. 1915. The Pickwickian Leaflet. Side 1. Many Happy returns to Basil & May but we hope that we shall be enjoying ‘Peace’ next May Day. I wish I had made a decent article but being on Active Service I can’t start afresh see over . . .
NO I. MONDAY MAY 1st 1916. MONTHLY. News from the Papers. Not a reflection upon De Coverley (3). I could not help thinking that this name of ‘Sir Roger’ has been disgraced. Goldsmith’s ‘Sir Roger’ was a good man, but the one who was put in the Tower of London ought instead to be shut up in a case of cement, then the noble knight would not even have a chance to ‘Wait & See’ what his Case meant, and repent. 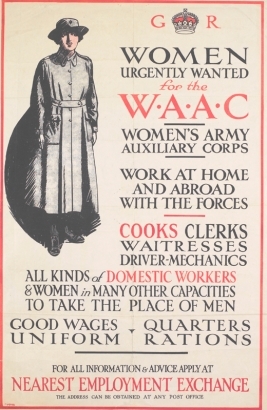 Pressure for WAAC began in 1914 but not officially established until Dec 1916. Women War Workers (4). What does Tommy on Home Leave think of ‘her’ who salutes and exclaims ‘Sir’ in the street, whenever they meet to greet him? Although I heartily agree with Women War Workers & congratulate their good work at the same time I should not like to see ‘Pickwick’ in masculine dress salute me at the door and address me as ‘Sir’ when I go on Leave. Pickwick you remember, when the Club was in being, was the name given to Ida. On the Recruiting Crisis (5). Rise fellow men! Our country yet remains. By that dread name We wave the sword on high, And swear for Her to live, For Her to die (6). This Easter tide ought to give us, along with its bright weather, a stimulus. This Spring we hope is the Herald of Victory before the Autumn. In any case `Victory’ will, in the end, be for the ‘Allies’. Pickwickian Leaflet. Side 2. NB See Welcome page Smiling Letter Home. Members Birthdays. Today the weather is beautiful, just the ideal May Day weather, & I hope the members of the Pickwick Club are enjoying Happy Birthdays. Where Home Epistles Go! ‘I wonder what my son is doing at this very minute’, sais a Mother who has just sat down to write a letter to her son at the Front. There are many who ask this to themselves & there are many at Home who wonder, not only where their friends & relatives are, but where their letters find them. I have received letters in places you would not dream of. The number of letters I have had while in the trenches are many, so also those received while encamping for the four or five days before going into the trenches again. I have had letters while in barns of old farms, in caves like those of Linley Caverns (7) besides huts, theatres, schools and dugouts. The daughter of Flo’s’ letter (8) I read at the entrance of a cavern, a letter from Father was read in a half tumble down dugout dripping with water and amidst the sound of rats squeaking. Many letters have been read by a log fire in an old barn and by the brazier in the trench. I shall never forget the letter I read as soon as daylight was strong enough. It goes without saying that all the letters are welcome to Tommy, he is so eager & keen to open them that he takes first opportunity no matter what is preventing. I once read a letter on the side of the road when I went for rations & had one handed to me from the QMS. A detailed account of one or two letters ‘where they went to’ will be given in each monthly issue of the paper. Look out to see where your next letter reached me. More Articles. The Pickwickian Leaflet, as its name implies, consists of literature on one page only. I have only been able to give a few articles this time. but I shall try to put more articles in next month; but it will be a case of Multum in Parvo (9). The PICKWICK CLUB of 1905. (1) The Pickwick Club: See Hibbett Letters 23rd April 1915; also 7th, & 13th Sept and 26th Dec. 1915. Transcription left: October 1905. The Pickwick Magazine. Editor: Sam Weller MPC (May Overend*). Motto: NIL DESPERANDO (Never Despair). Sam Pickwick President: I Hibbett. Augustus Snodgrass Member: Sydney Hibbett (8 yrs). 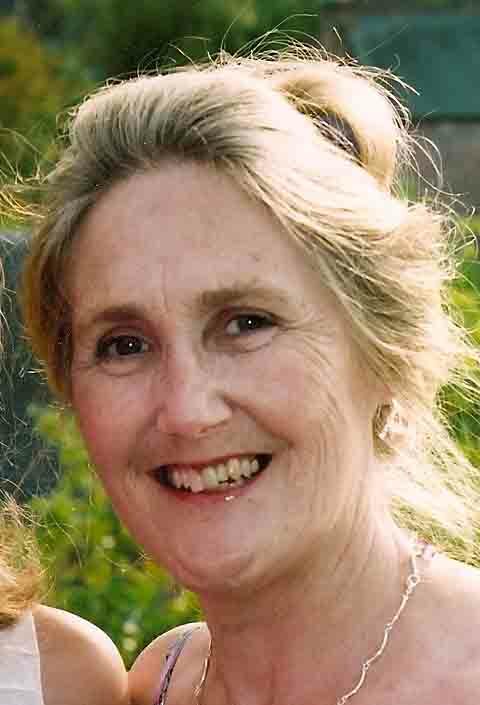 Sam Weller Member: May Overend. Tracy Tupman Member: Bertie Hibbett (7 yrs). Sam Wardle Member: I. Cozens*. Nath(anual) Winkle Member: D Cozens* (10 yrs). NB The Cozens were sons of W.H. Cozens*, Superintendant of St Paul’s Sunday School Walsall, lived at Furzedown, Streetly Lane, Sutton Coldfield, mentored Bertie Hibbett’s Sunday School work from 1913. (3) Sir Roger de Coverley: character in The Sir Roger de Coverley Papers, The Spectator 1711 (daily publication byJoseph Addison (1st May 1672- 1719) & Richard Steele ). An English Squire with values of old country gentleman, ‘lovable but ridiculous’, politics ‘silly but harmless’. <http://http://www.enwiki.com&gt; and http://www.enotes.com/topic/sir-roger-de-coverley/critical essays> ‘a gentleman of Worcester, of ancient descent, a baronet/ ‘quaint & lovable representation of Tory landowning class an aimiable but rather inneffectual anachronism’. Also a English/Scottish country dance, published c 1695. Oliver Goldsmith 1728-1774: Anglo-Irish novelist, poet, dramatist. (NB I am unable to discover connection with Sir Roger or with 1916 newspaper). (4) Women War Workers/women in uniform. See Hibbett Letter Cartoon 28th April 1916. (5) The Recruitment Crisis 1916. Military Service Act (27th Jan. 1916): compulsory conscription of 19- 41 yr old men/ no choice given re service, regiment or unit. Age lowered to 18 yrs on 25th May 1916. Tribunal Appeals (re illness, disability, ‘starred occupation’ – essential work on Home Front) meant Military Act failed to deliver numbers required. <http://www.1914-1918.com&gt; Long Long Trail. (6) Rise fellow men! –Sir Thomas Lawrence Campbell, 1777-1844, Scottish Poet – re Battle of Maciejowice, Poland 10th Oct. 1794 (Russians defeated the Poles). (7) Linley Caverns, Aldridge, Staffordshire. Extensive 19th cent. limestone workings now flooded: ‘an incredibly dangerous place’. Used for storing bombs in WW2. See <https:brownhillsbog.com> Urban Exploration at Linley Caverns. 1957 (Walsall Observer:16th Aug.1957). (8) i.e. Flo’s daughter’s letter: Flo? (9) Multum in Parvo: Latin ‘Much in a small space‘. (10) Winkle: a Pickwick Club name for Bertie. NB the Pickwick Club note above, gives him as Tracy Tupman. NEXT POST: 10th May 1916. Battle of Maciejowice Poland 1794.Chelers 1916.Conscription 1916.Hibbett Birthdays.Hibbett Pickwick Club/ Leaflet 1916.Linley Caverns.Military Service Act 1916.Oliver Goldsmith.QMSRats.Recruitment Crisis 1916.Sir Roger de Coverley.Sir Thomas Lawrence Campbell.St Paul's Sunday School Walsall.Tribunal Appeals 1916.Women War Workers 1916.Women's Army Auxiliary Corps WAAC 1916.